THAILANDE – Phetchabun - A recently discovered Khmer-style artefact links a historical northern Thai town to the wider Southeast Asian region, not only proving Thailand’s cultural wealth of old, but also adding an important piece to the puzzle about the region’s trading significance in pre-Siam days.The statue, featuring Vishnu, the revered Hindu deity of South and Southeast Asia, was unearthed at the Sithep Historical Park in Phetchabun. In archaeological and historical terms, it seems to tick a lot of boxes. 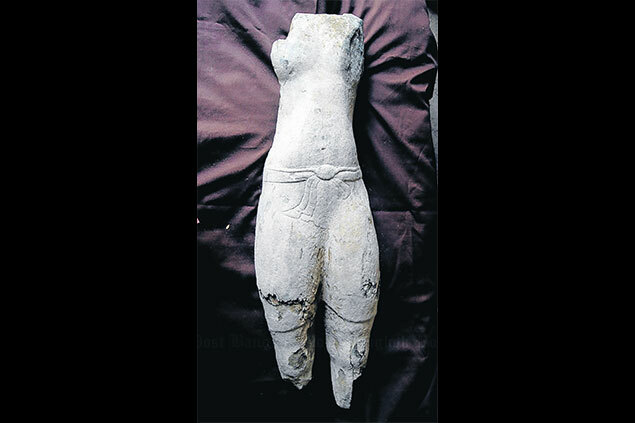 The statue, missing its head, arms and knees, was excavated from a moat west of Sithep town in late January. While physically incomplete, the piece adds significantly to the knowledge of ancient civilisations before historical records were kept. Pongdhan Sampaongern, chief of the Sithep Historical Park, said the Vishnu statue is similar to others found in ancient sites in other parts of the country including Nakhon Si Thammarat, Surat Thani and Prachin Buri, as well as certain areas in Oc Eo town in Cambodia and the Mekong Delta in Vietnam. FRANCE – Sidossi - Le Niolu révèle un objet préhistorique unique: un moule à parures datant de l'âge de fer a été découvert aux abords du village de Sidossi sur la commune de Calacuccia en Haute Corse. C'est un objet préhistorique unique qui a été mis à jour: un moule de "pendeloque plume" datant de l'âge de fer. Les pendeloques, ces éléments de parure, étaient très portées à l'époque de l'âge du fer, à partir de moins 800 avant JC. Si beaucoup de "pendeloques plumes" ont été trouvées dans le Cap Corse, aucun moule n'avait pour l'heure été identifié sur l'île. 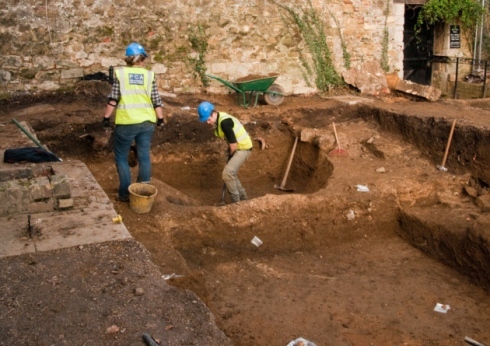 ROYAUME UNI – Hartlepool - The discovery of an apparent Anglo-Saxon grave underneath a church could be proof of the siting of a Seventh Century monastery. The find, which archaeologists are describing as “exciting”, was unearthed while work is being done to St Hilda’s Church, on Hartlepool’s Headland. The floor has been taken up at the historic church to make way for a new heating system, and experts at Tees Archaeology have been at the church for recording purposes working on two areas measuring 27ft by 27ft. As well as the Anglo-Saxon grave, another six, believed to date between the 1600s and 1900s, were also found, as well as various loose bones. INDE – Hyderabad - After Charminar, the latest to fall prey to poor maintenance and sheer apathy of the department is Qutub Shahi Tombs. What strikes one on entering this royal cemetery is the tampering of the compound wall near the booking counter. A full-size iron gate has been installed by removing a portion of the wall to create a passage to the Masjid-e-Abdulla Qutub Shahi from the neighbouring Gulshan Colony. As per records, there is only one entry and exit for the tombs. 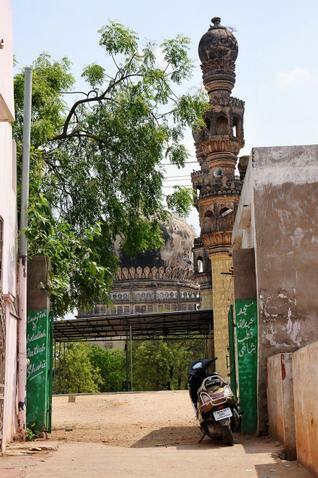 But a few people from Gulshan Colony wanted to have access to Masjid-e-Abdulla Qutub Shahi and a portion of the wall was tampered to install a gate, says a senior official of Archaeology Department. The mosque is not far from the main gate. Yet, the residents wanted to have another access claiming that the aged and children were finding it difficult to walk around from the main gate and reach the masjid. PALESTINE – Gaza - UN Watch, an independent Geneva-based monitoring group, has sent a letter to UNESCO, calling on the international body to take immediate action to stop Hamas from bulldozing of a 3000-year-old Gaza harbor for use as a terrorist training camp. The partial destruction of the ancient Anthedon Harbor—which includes the ruins of a Roman temple and archaeological remains from the Persian, Hellenistic, Roman and Byzantine eras—follows its nomination as a World Heritage site. INDE - Pattikulam - A team of archaeologists, while excavating the ancestral property of a villager at Pattikulam near Pottampatti, stumbled upon stone inscriptions and houses dating back to 4th Century AD on Sunday. 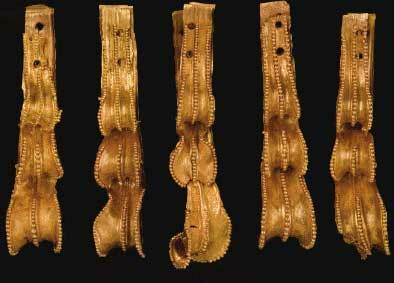 The team, led by V Narayanamoorthy, secretary of Tamil Nadu Archaeological Research Institute, and P Kannimuthu, historian and archaeologist, found these relics in Palani. The inscriptions bore characters resembling Tamil and Sanskrit scripts. Around three stone houses were found by the team. 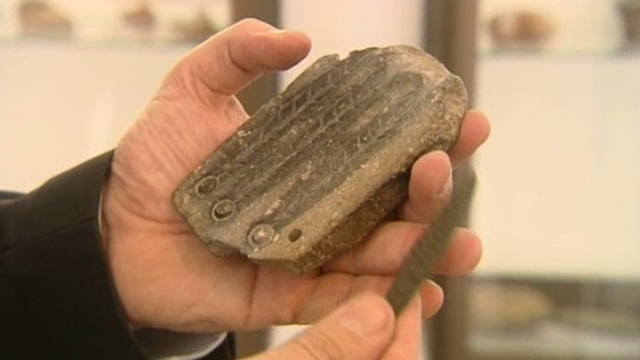 The team said that the inscriptions were seldom found in Asia. With a big temple nearby, the team said that the findings could not be an isolated incident, and might shed some light on the role played by Palani in ancient times. V Narayanamoorthy said that Palani was the hub of economic activities during the Pandya era. He said that many of the inscriptions found, extolled the architectural style of temples. The team said that the findings gave some clues about the method of administration in the Pandya era. According to archaeologists, the place would have been put to use as a funeral ground till around the 4th century AD, after which the practice was discontinued. Narayanamoorthy said that some human skulls bearing scratches were found giving weight to the theory that the place was a funeral ground.